Motul factory line chain lube for road motorcycles, karts, etc. White in color and very sticky as needed for hi performance machines. All types of chains : standard and with O - RING, X-RING, Z-RING A result of Motul's experience in motorcycle racing, only for road use (sticky product) LUBE Factory Line is a lubricant specifically developed to lubricate racing motorcycle chains: Road Racing and Endurance. 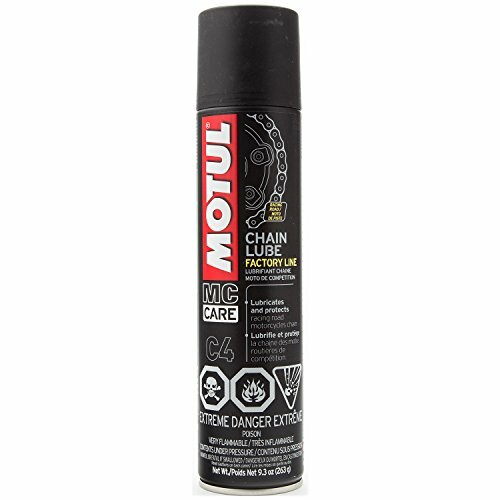 Specially recommended for very fast bikes : MOTUL CHAIN LUBE Factory Line adheres to the chain even at high speeds. OK for use on O, X and Z rings.